Robert Seidel (*1977) began his studies in biology before transferring to the Bauhaus University Weimar to complete his degree in media design. 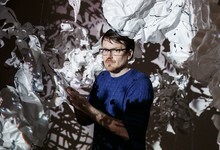 His projections, installations and experimental films have been shown in numerous international festivals, as well as at galleries and museums such as the Palais des Beaux-Arts Lille, ZKM Karlsruhe, Art Center Nabi Seoul, Young Projects Los Angeles, Museum of Image and Sound São Paulo and MOCA Taipei. His works have been honoured with various prizes, including the KunstFilmBiennale Honorary Award and the Visual Music Award Frankfurt. In his work Seidel is interested in pushing the boundaries of abstracted beauty through cinematographic approaches, as well as ones drawn from science. By the organic interplay of various structural, spatial and temporal concepts, he creates a continuously evolving complexity. Out of this multifaceted perspective emerges a narrative skeleton, through which viewers connects to the artwork on an evolutionary-derived and phylogenetic-fixated symbolic level. Seidel lives and works in Berlin and Jena as artist as well as curator.